Rosehill Cemetery was established in 1859, followed the next summer by Graceland Cemetery and the Catholic Calvary Cemetery. These were Chicago's first rural cemeteries, following the model best illustrated by Mount Auburn Cemetery near Boston. Although Oak Woods Cemetery, located several miles south of the Chicago's city limits, was established in 1853, it did not begin interments until the mid 1860s. 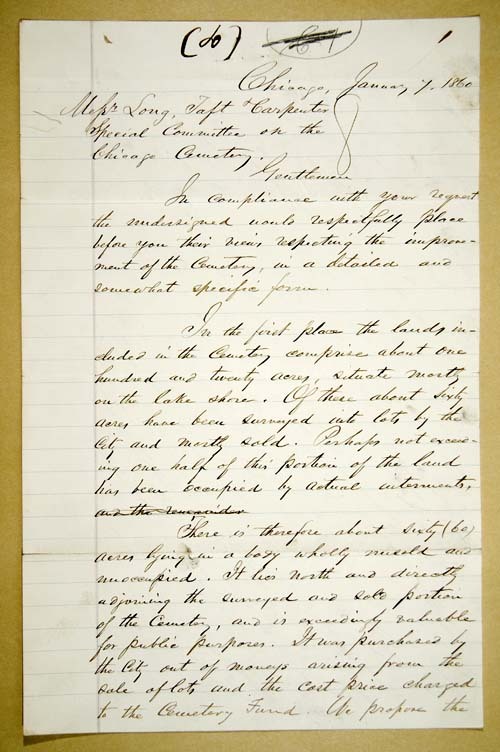 The town of Lake View, located several miles north of the city limits, was high above the water table, alleviating Dr. John H. Rauch's concerns regarding the City Cemetery's location near the lakeshore. Lake View became the home of Graceland and Rosehill cemeteries. Calvary Cemetery established grounds on the lake shore of Chicago's current northern border, adjacent to the city of Evanston. 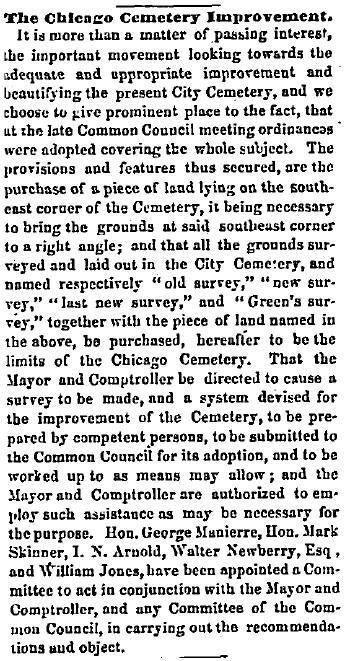 With the establishment of the new cemeteries miles beyond the city limits, Chicagoans had the first opportunity to move their loved ones from the City Cemetery grounds to more pleasant surroundings. Existing lot owners were given the option to exchange their City Cemetery lots for equal-sized lots at the other cemeteries. The most prominent early disinterment (1861) was of Frances M. Pearce, the wife of H.O. Stone, who also commissioned a white marble sculpture in her likeness. Reclining with their baby, also named Frances, the sculpture depicts the mother and child, who died within months of each other during the cholera outbreak of 1854. This sepulchral monument from the City Cemetery stands today in Rosehill Cemetery. During the Civil War years of 1862 through 1865, Camp Douglas, originally a Union camp, served as a prisoner of war camp for Confederate prisoners of war. During these years, due to the poor conditions at the Camp, the mortality rate for the rebel soldiers was extremely high. Nearly 4,000 of these soldiers were buried in the City Cemetery's potter's field. See the Potter's Field section for more details. According to Dr. John H. Rauch, from January 1860 to March 1866, eleven thousand three hundred forty-one (11,341) individuals were buried in the City Cemetery. This figure includes the 4,000 Civil War rebels, mentioned above. 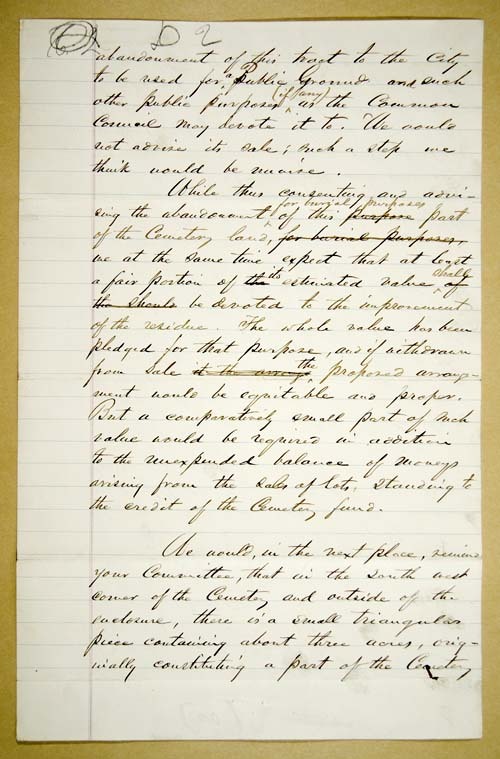 In this document, the "memorialists", as they were then referred to, are following up on a request by the Common Council to propose improvements to the City Cemetery. 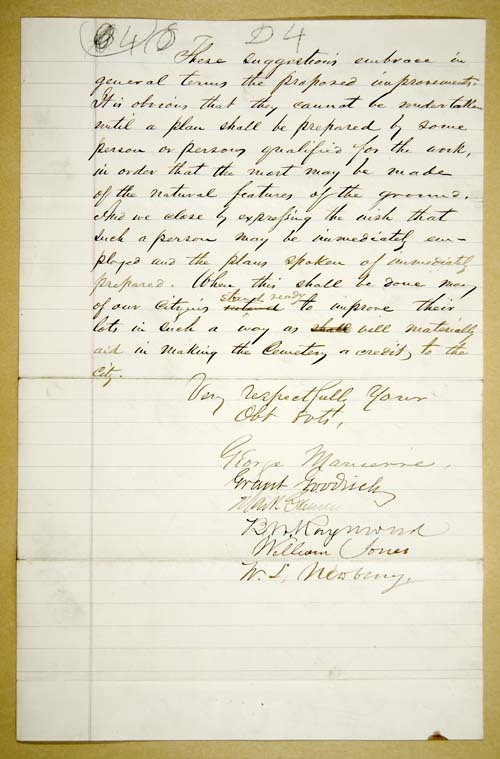 This group of cemetery lot owners pleaded for the city to improve the condition of the cemetery grounds in a letter dated November 9, 1859, which is presented in the previous section - 1855-1859. In compliance with your request the undersigned would respectfully place before you their views respecting the improvement of the Cemetery, in a detailed and somewhat specific form. In the first place the lands included in the Cemetery comprise about one hundred and twenty acres, situate mostly on the lake shore. Of these about Sixty acres have been surveyed into lots by the City and mostly sold. Perhaps not exceeding one half of this portion of the land has been occupied by actual interments. abandonment of the tract to the City to be used for Public Grounds and such other public purposed (if any) as the Common Council may devote it to. We would not advise its sale; such a step we think would be unwise. While this consenting and advising the abandonment for burial purposes part of the Cemetery land, we at the same time expect that at least a fair portion of its estimated value shall be devoted to the improvement of the residue. The whole value has been pledged for that purpose, and if withdrawn from sale the proposed arrangement would be equitable and proper. But a comparatively small part of such value would be required in addition to the unexpended balance of moneys arising from the sales of lots, standing to the credit of the Cemetery fund. grounds, but now separated therefrom by North Clark street. This small tract we would advise the sale of; the proceeds of the sale to be added to the Cemetery Fund for the like purpose of improvement. 4th That the avenues and walks through the Cemetery be permanently improved by gravelling or otherwise. These suggestions embrace in general terms the proposed improvements. It is obvious that they cannot be undertaken until a plan shall be prepared by some person or persons qualified for the work, in order that the most may be made of the natural features of the ground. And we close by expressing the wish that such a person may be immediately employed and the plans spoken of immediately prepared. Where this shall be done many of our Citizens stand ready to improve their lots in such a way as will materially aid in making the Cemetery a credit to the City. Your Special Committee to whom was referred the Memorial of Hon. Geo. 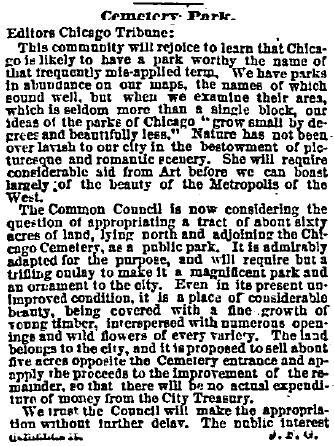 Manierre, Wm Jones & others on the subject of permanently improving the Chicago Cemetery. Having had the same under advisement, beg leave to report, That they have met & consulted with the Memorialists on the subject, who have kindly written out their views & furnished them to us, & which we adopt & herewith submit as part of our Report. 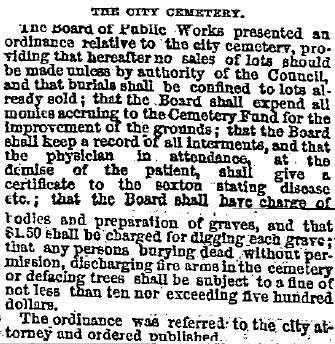 A negotiation is now pending with the officers of the “Rose Hill Cemetery” for a Section of their grounds wherein to bury the dead falling under the City’s charge, & also to insure a cheap & proper burial place for the poor. It seems to have become a settled thing in the public mind, that no further extension of Cemetery grounds within the City limits be permitted, indeed when we look to the deterioration of property in their vicinity & the barrier which is placed to the improvement & extension of our City in their direction, we see the justice of the public sentiment. Ordered – That the Mayor & Comptroller be requested to negotiate for the purchase of a piece of land lying on the South East corner of the Cemetery; it being necessary to bring the grounds at said S.E. corner to a right angle. 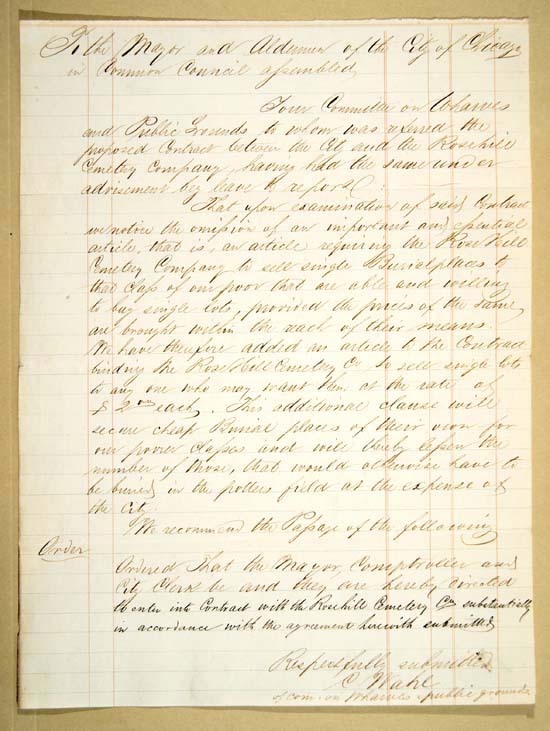 Ordered – That the Mayor & Comptroller be directed to cause a survey to be made & a system devised for the improvement of the Cemetery, to be prepared by competent persons, to be submitted to the Common Council for its adoption, and to be worked up to as means may allow - & the Mayor & Comptroller are hereby authorised to employ such assistance as may be deemed necessary for the purpose. Ordered – That Hon. Geo. Manierre, Hon. Mark Skinner, Walter Newberry, Esq., Wm. Jones, Esq., and J.N. Judd Esq. Be appointed a Committee to act in conjunction with the Mayor & Comptroller & any committee of the Common Council in carrying out the recommendations & orders herewith submitted, & that they be respectfully requested to accept the appointment & give the matter their particular attention & supervision, & apply to & advise with the Common Council at any time seemed necessary to further & consummate the object. 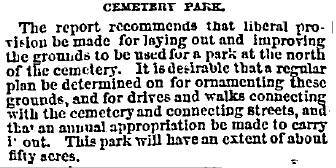 These short newspaper articles tell of some ways the City was attempting to improve the city's cemetery grounds. Although no new lots were sold after 1859, by 1862, the City Cemetery had been improved to include a small fountain. John C. Ure, a gardener who oversaw the public parks, was also responsible for the landscaping of the city's cemetery. This is an excerpt from a longer article titled, "Our Burial Places. Graceland, Rosehill and the City Cemeteries". The author gives an overview of some of the complaints related to the desire to move the City Cemetery. In addition to the perception of an urban proximity being objectionable as a final resting place, the article cites the health concerns as related to the argument that will come with greater force in 1866 with the publication of Dr. John H. Rauch's pamphlet titled, "Intramural Interments in Populous Cities, And Their Influence Upon Health and Epidemics." 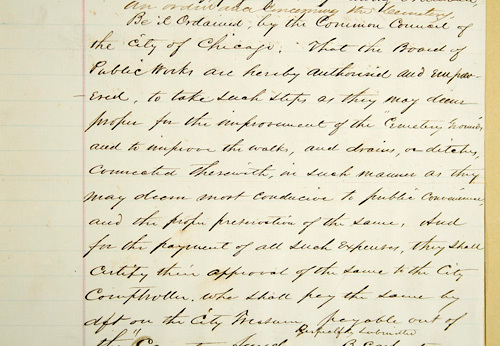 In 1861, the new Board of Public Works became responsible for the care and record-keeping relating to the Chicago City Cemetery. See the complete list of cemetery related costs HERE. Gentlemen: In conformity with the requirements of the new charter organizing the department of the municipal government, we transmit herewith the annual report of the Board of Public Works. The Board was organized May 6th, 1861. Suitable rooms had previously been provided in the Court House and as soon as was practicable the rented offices occupied by the late Boards of Water and Sewerage Commissioners were vacated. All the city departments are gathered into one building and it is a matter of considerable convenience to the citizens that the payment of the water tax and business with the water and sewerage departments as with other departments under the care of the Board and can be attended to where the general city tax is paid, and where are the various offices of the city government. By the terms of the act of organization this Board is charged with the care of the Water Works and the Sewerage Works, the Public Parks and other public places of the city, the Streets the River and Harbor and Public Buildings, the Bridges, the Lamps and Lights to the lighting of public places and buildings of the city and with the direction of all the public improvements hereafter to be commenced by the city. There have thus been transferred to this Board the duties of the Water Commissioners, the Sewerage Commissioners, the Street Commissioners, the City Superintendent, and of the Special Commissioners for the making of assessments. Statement of Expenditures by the Board of Public Works from May 6, 1861 to Dec. 31, 1861 inclusive. The Board of Public Works presented an ordinance relative to the city cemetery, providing that hereafter no sales of lots should be made unless by authority of the Council. And that burials shall be confined to lots already sold; that the Board shall expend all monies accruing to the Cemetery fund for the improvement of the grounds; that the Board shall keep a record of all interments, and that the physician in attendance at the demise of the patient, shall give a certificate to the sexton stating disease, etc. 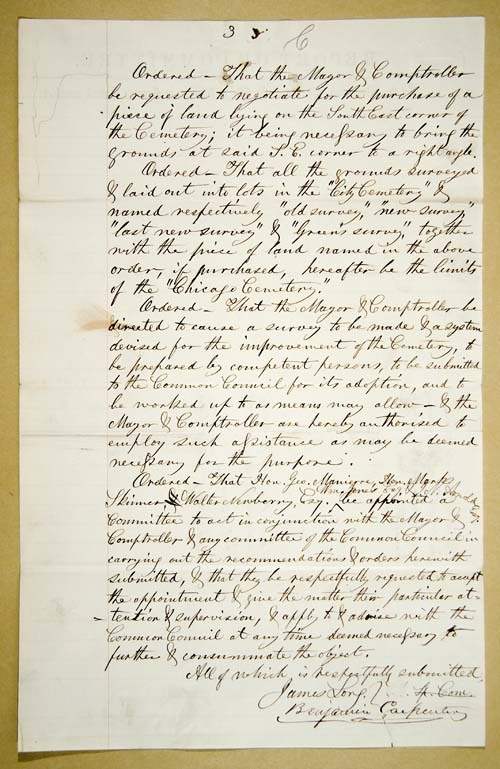 ; that the Board shall have charge of bodies and preparation of graves, and that $1.50 shall be charged for digging each grave; that any persons burying the dead without permission, discharging fire arms in the cemetery or defacing trees shall be subject to a fine of not less than ten nor exceeding five hundred dollars. The ordinance was referred to the city attorney and ordered published. This large image is the second page of undertaker C.H. 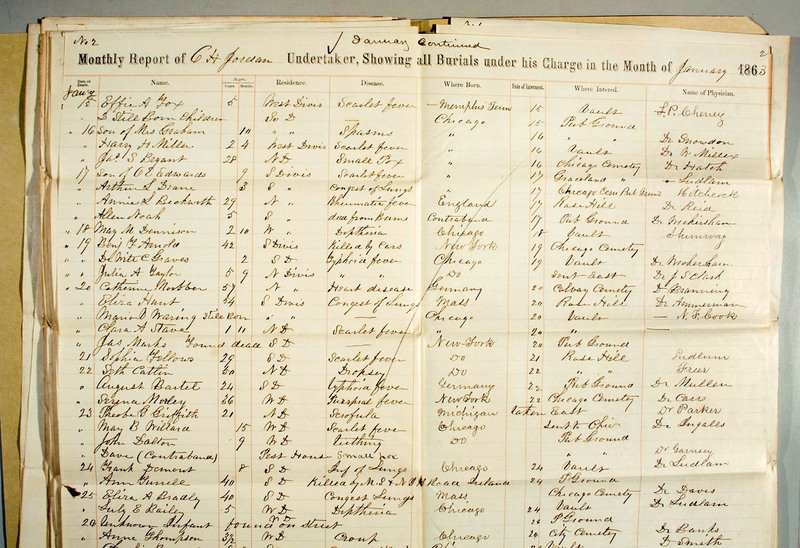 Jordan's list of the dead whose burials he arranged in January 1863. It is one of twelve lists submitted to the city by separate undertakers during that month. I photographed these records in the Common Council files at the Illinois Regional Archives Depository. All Common Council files in this project are presented courtesy of IRAD. See the Undertaker and Sexton section for images of the other undertaker lists from January 1963.
one in Graceland Cemetery, one in Calvary Cemetery, two were "sent east", and one was sent to Ohio. The "Residence" column indicates the North, West, or South Division. The Divisions were so-named in relation to the branches of the Chicago River. In 1861, the city government decided to allow the northern section of the unsurveyed cemetery grounds to begin to be converted to a park. This so-called Cemetery Park is illustrated on the homepage of this Web Site as the overlayed image on the satellite map of today's Lincoln Park. 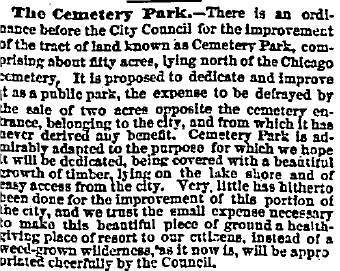 In 1865, Cemetery Park became Chicago's second park named Lake Park. Nine months later, upon the assassination of President Lincoln, the park was named in his honor. 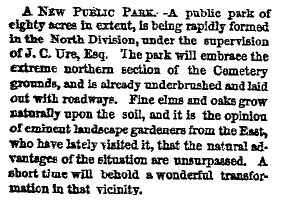 The article below, is the newspaper's first mention of the newly forming park on the northern unused portion of the City Cemetery. To the Mayor and Aldermen in Common Council. 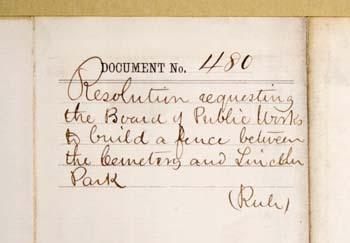 Several Complaints being made of lot holders of the old Cemetery of Cattle running at large over the Grounds, & therefore recommend the passage of the following resolution. Presented to the Mayor for approval Oct. 21st 1865. A. H. Bodman City Cler. Commission of Public Works, Annual Report, 1863. That upon examination of said Contract we notice the omission of an important and essential article, that is, an article requiring the Rose Hill Cemetery Company to sell single Burial places to the class of our poor that are able and willing to buy single lots, provided the prices of the same are brought within the reach of their means. 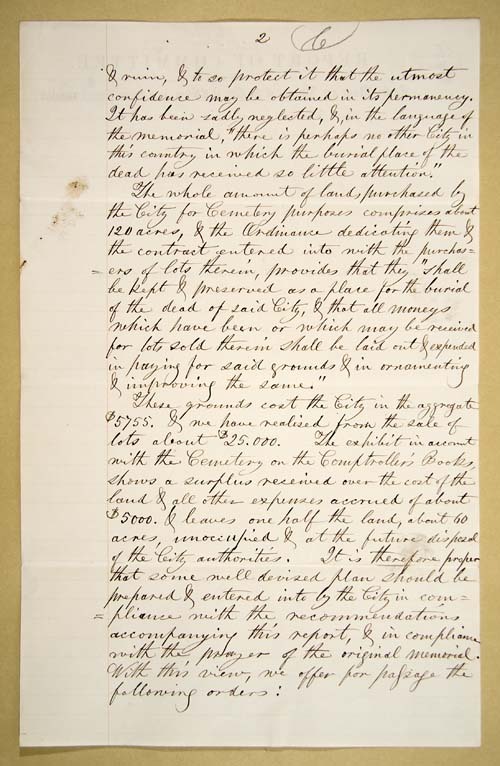 We have therefore added an article to the Contract binding the Rose Hill Cemetery Co to sell single lots to any one who may want them at the rate of $2.00 each. This additional clause will secure cheap Burial places of their own for our poorer classes and will thereby lessen the number of those, that would otherwise have to be buried in the potter’s field at the expense of the City. Ordered That the Mayor, Comptroller and City Clerk be and they are hereby directed to enter into Contract with the Rosehill Cemetery Co. substantially in accordance with the agreement herewith submitted. C. Wahl of Com. on Wharves & Public Grounds. 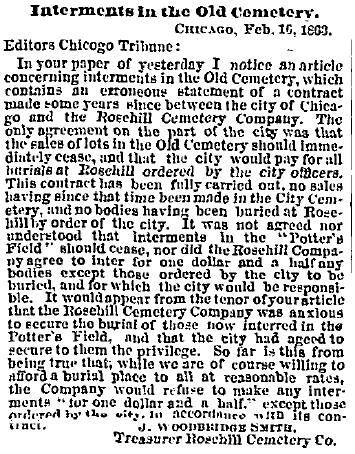 This section of a larger newspaper editorial, which is reproduced in its entirety in the Potter's Field section, references the 1860 agreement with Rosehill Cemetery. The Rosehill Cemetery Company's response is on the right. 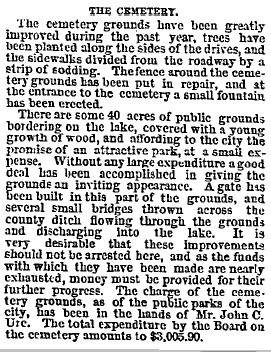 This newspaper item is a transcription of the minutes from the Common Council meeting where the decision was made to call the northern cemetery grounds, "Lake Park." The park was renamed "Lincoln Park" in 1865 after the assassination of the President, also due to the fact that there was already a Lake Park in Chicago. 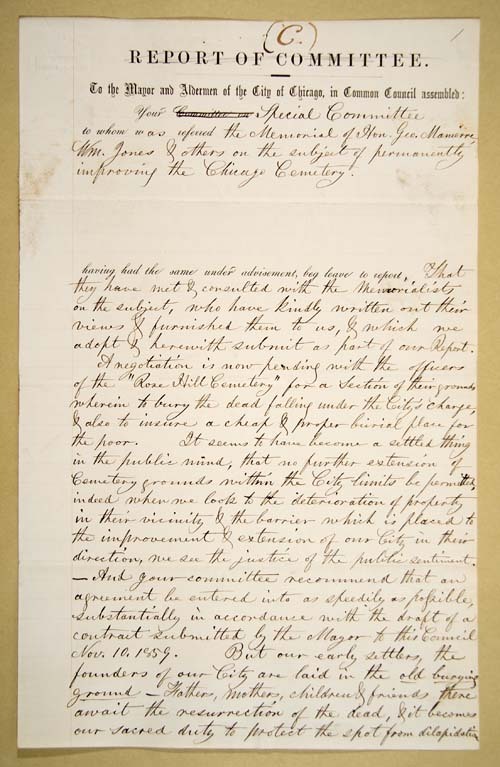 See the original document, here. The ordinance referred to in this article is reproduced in the following section of this Web Site: 1865-1869. Special Meeting – A New Park on the North Side. Pursuant to notice, a special meeting of the City Council was held last evening to take final action on the North Side Park – His Honor the Mayor in the chair. The following aldermen answered their names: Aldermen Gage, Shimp, Gallup, Kann, Comisky, Clark, Rafferty, Talcott, Holden, Bond, Gastfield, Huntley, Armstrong, Frazer, Ruh, Hottinger, Sullivan, Lawson, O’Sullivan. The Clerk read the ordinance providing for the Park, and a substitute proposed by B.F. Ayer, Esq., for section III in said ordinance. Ald. Holden was in favor of section I and II, but was opposed to section III. Ald. 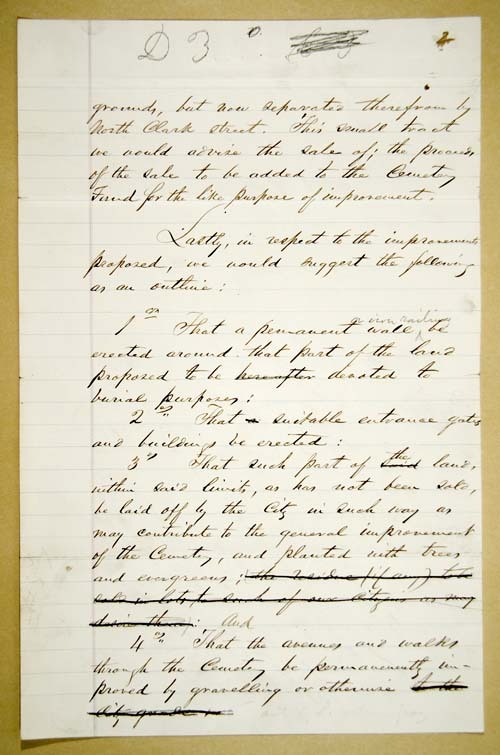 O’Sullivan could not see the propriety of adopting a part of the ordinance if it were not all adopted. Ald. Gage wanted to know how many acres had been laid off for a park. Ald. Armstrong said about sixty acres. Ald. Kann wanted to know where the poor will be buried if the land be sold. Ald. O’Sullivan said that the Rosehill Cemetery Company had agreed to bury the poor of the city. Ald. Talcott was opposed to the sale of the land for cash. It would not bring as much, if sold in that manner, as on canal time. Ald. Huntley was opposed to the sale of any city property for the benefit of the park. He was in favor of granting the land for the park, and an appropriation could be afterwards made. Ald. Talcott said it would take more than $20,000 to improve the property. It can’t be done for less than $50,000. Ald. Titsworth had no objection to setting off a portion of the city property for park purposes. He questioned the propriety of making provisions, in the same ordinance, for its improvement. He was in favor of gradual improvement, as the property in the neighborhood would gradually increase in value. He was opposed to selling the property now, as it would bring more after the park had received a little improvement. He was in favor of parks. Ald. Shimp was opposed to the sale of the property now. It would not bring more than $15,000. If the park be laid out, in five years it would sell for $100,000. Ald. Armstrong said the property proposed to be sold was fully half a mile from the park. Ald. Talcott moved to lay the substitute for the third section on the table. Carried. Ayes, 18: noes, 5. Ald. Ruh moved to take the ordinance up by sections. Carried. The first section was then read and adopted. The second section was taken up. Ald. Holden’s motion was lost. On motion, the Council took up section 2d, and it was unanimously adopted. The 3d section was next taken up. Ald. Bond moved to lay on the table. Carried. The question of name was taken up. Ald. Woodman moved to call it “Lake Park”. Ald. Woodman moved that the ordinance was adopted as a whole. On motion of Ald. Tittsworth, the Council adjourned.